Baton Rouge, Louisiana – Tuesday, January 10, 2017 - Lamar Advertising Company (Nasdaq: “LAMR”) will release its fourth quarter ended December 31, 2016 earnings report before the market opens Wednesday, February 22, 2017. Lamar will host a conference call on Wednesday, February 22, 2017 at 8:00 a.m. (central time) to discuss the Company’s results and answer questions relating to company operations. 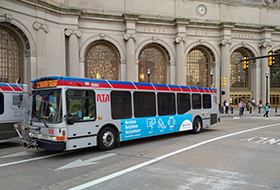 Lamar Advertising Company (Nasdaq: LAMR), one of the largest out of home advertising companies in North America, today announced its new transit advertising contract with the Greater Cleveland Regional Transit Authority (RTA) for a five-year term. Lamar Advertising Company (Nasdaq: LAMR), a leading owner and operator of outdoor advertising and logo sign displays, announces that its board of directors has declared a quarterly cash dividend of $0.76 per share payable on December 30, 2016 to stockholders of record of Lamar’s Class A common stock and Class B common stock on December 19, 2016.